"It's crazy. Someone gave me a head." La Sentinelle tells the story of one Mathias Barillet (Emanuel Salinger), a young student of medicine who transfers from his preparatory school in Aachen, Germany to an intern position in Paris, France. En route via train, he is briefly detained on a matter of "papers"; his baggage are ransacked, and he is released. 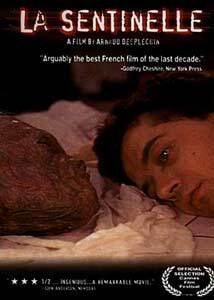 Unpacking his bags in his Paris hotel, he discovers a shrunken head, apparently of recent origin. Using the facilities at the university, he begins to piece together the story behind the grisly artifact, encountering opposition from the French Secret Service as he gets closer to the truth. This all sounds a good deal more exciting in summary than La Sentinelle is in the viewing. Clocking in at two hours and nineteen minutes, Arnaud Desplechin's film starts out slowly and never really shifts into gear. The plot has its share of twists, turns and revelations as Mathias delves into the mystery while the Secret Service infiltrates his life, but every "beat" tends to drag more than it ought. The camera dwells lovingly on such minutiae as the preparation of a microscope slide; the level of detail can be fascinating, but one often wishes for a little brisk exposition. Part of the problem is that Mathias is a bit of a cipher—he never reacts to anything with much emotion (the discovery of a head in his luggage provokes only a bewildered, depressed expression) and after a while we stop caring what happens to him. Supporting performances by Marianne Denicourt as his sister, Emmanuelle Devos as his short-term girlfriend Claude, and Jean-Louis Richard as a Secret Service agent with a hidden agenda provide some flavor, but very little actually happens and the film's many dramatic confrontations are oddly colorless and unsatisfying. Director/co-writer Desplechin deserves credit for the concept itself—there's something creepy and fascinating about the lifeless, sewn-shut eyes of the head, and it's easy to understand Mathias' obsession (intellectually, at least) with discovering its origin. The film is technically well-executed, with decent lighting and some fine image composition. But the film tilts slowly, almost imperceptibly off the tracks as it goes; the serious, realistic performances and deliberate pace seem intended to boost its credibility, but serve only to deaden its effect. Humorless and leaden, La Sentinelle has the trappings of a thriller but with little of the style. Having risked his life for your cinematic safety, your friendly neighborhood dOc Sentinel considers his mission accomplished. Image Transfer Review: La Sentinelle is presented in its original 1.66:1 theatrical aspect ratio, with a letterboxed non-anamorphic transfer. The DVD appears to have been mastered from a 30fps broadcast-quality videotape rather than a 24fps film print, as 3:2 pulldown and a few videotape glitches are evident. The image becomes murky in darker scenes, with poor shadow detail; the film's subdued color palette is otherwise captured reasonably well, with competent picture detail most of the time. The dual-layer transfer is soft, but not unwatchable by any means, and I've certainly seen worse. Audio Transfer Review: Fox Lorber presents La Sentinelle with a French Dolby Digital 2.0 monophonic soundtrack, ProLogic-decoded to the center speaker. Dialogue is reasonably clear and comprehensible, and Marc Oliver Sommer's spare piano and woodwinds score is supported by passable frequency range. There's no real bass to speak of, but not much to complain about either—an average audio presentation. Extras Review: This is a bare-bones disc even by Fox Lorber standards, with a mere 8 chapter stops, filmographies and awards lists for the director and four cast members, and two screens of cast-and-crew Production Credits. The company's traditional Weblinks aren't included, and the English subtitles (typos and all) are burned into the film image, forcing French-speaking viewers to put up with them. La Sentinelle features an intriguing concept, but the story gets bogged down early on and never quite recovers, despite some interesting visuals and naturalistic performances. Fox Lorber's DVD transfer is of middling quality with few supplements; fans of dark, bizarre, patience-straining mysteries may find something of value here, but most viewers are advised to seek their thrills elsewhere.